I’ve always known that at some point I wanted to make a simple french cardigan jacket. 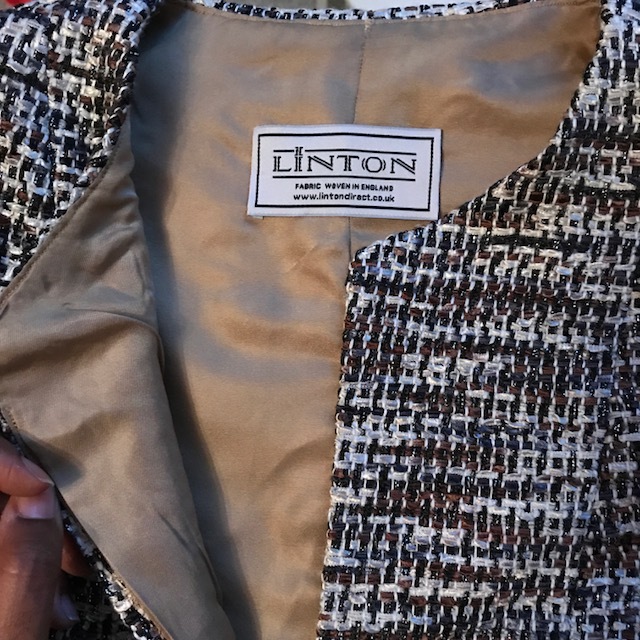 It wasn’t that long after I started sewing that I found out about the UK’s very own Linton Tweeds, a long time supplier of the fabrics used by couture houses such as Chanel for, amongst other things, this classic style of jacket. 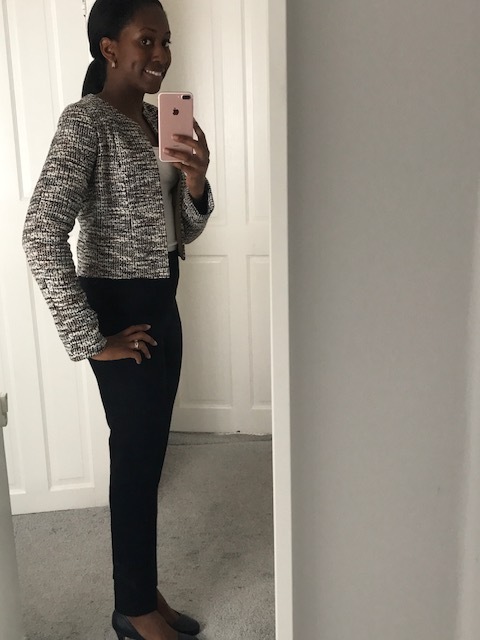 I ordered two fabrics which have been sitting patiently in my stash for ages..
.. and then a few weeks ago, Sew Over It released their Coco Jacket pattern, and I just knew I wanted to make one. I sent the pdf to a copy shop for printing – because who’s got time for all that trimming and taping anymore? Not me, my friends. Not me. Sizing: My measurements put me between an 8 and a 10. I looked at the finished measurements, measured some of the pattern pieces, and spoke to my good friend Bianca who had also started a Coco, to see how she was getting on. Bianca found it on the large side, and that convinced me to go with the size 8. I’m glad I did, and like the fit. Alterations: While deciding on a size, I decided I would need to add an inch to the sleeve length. Unfortunately, I forgot about this when I came back to it the next evening, and cut the original sleeve! I later had to cut a little extension from the fabric and sew it on to the sleeve, like a cuff. Fortunately after pressing it, I don’t think anyone would notice, but it is a shame I made that mistake. I also didn’t think to trace off a back lining pattern piece to add a pleat to the centre back for more wearing ease 😦 .. one for next time though! Instructions: Sew Over It’s instructions are always clear, and this is no exception. 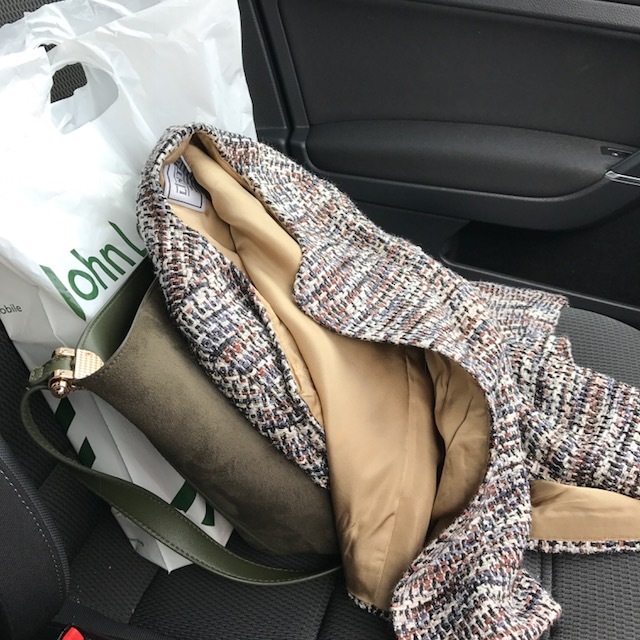 The instructions prompt the reader to interface all the pieces if their fabric is loosely woven, and I’m glad I did so because this tweed FRAYED like you wouldn’t believe. 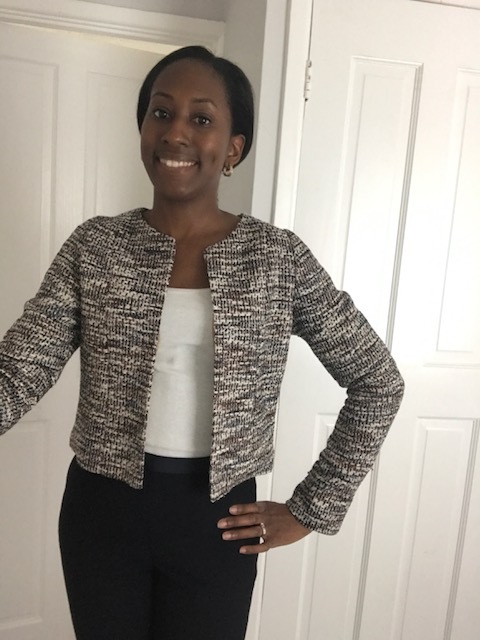 Even with the interfacing there was still fraying at the hem and sleeve hem, so I think this jacket is a little shorter than it would be with a clean 5/8″ hem allowance. The pattern calls for the lining to be cut to exactly the same size as the main fabric, and then basically machine stitched to it all the way around the outer edges and hem, and then turned through a gap left in a lining seam. This is obviously not the couture quilted lining method, but I don’t think there’s any pretence that this is meant to be that sort of 70-hour project. In fact, it’s a really quick sew. I deviated from the instructions in order to hand stitch the lining at the hem, so that I could control the hem allowance and make sure it wouldn’t peek out at the bottom. I also stitched the lining seam allowances to the main fabric seam allowances at the shoulder sleeve intersection, the underarm, and at a few points down the princess and side seams. This was done with loose loops so as to keep the lining roughly in place without being tight enough to cause tension on the lining. Difficulty: This was a nice and easy project, and a quick sew. The fraying of the fabric was the only thing that made it more time consuming and nerve wracking. There aren’t any small or fiddly pattern pieces, and if I wasn’t sewing at night, I think this could have been done in a day. I love it! Your final jacket looks very polished and smart. You really don’t notice the sleeve addition on the cuff at all. I made a Coco a while ago and added a section of main fabric along the inside to sew the lining to which I think worked better with the thick wool I used for my version. Thanks Caroline! Ooh, yours looks so cozy and I bet that blue is a great accent piece in your wardrobe! I think that hem facing is a really good idea, if I make a third version I’m definitely going to try that. Gives you somewhere to attach the chain, too! Beautiful jacket definitely the nicest Coco I have seen so far … Have added to my ‘must make’ list! Thanks so much, Val! Hope you enjoy making yours when you get around to it!! This is gorgeous! The style suits you so well! Thank you so much, Jo! I can see why it’s such a classic style, I think it would flatter most people! Ive bought this pattern but not made it up yet so your comments are very useful. Your jacket looks great so I hope I’ll be able to do the same. Thanks mumokio, I’m glad it’s helpful! Good luck with yours, I’m sure you will come out of it with a lovely jacket too! This looks very nice on you! I really tried so hard to see where you added the length to the sleeve, but I couldn’t see it! I’m considering making this pattern to wear more as a spring jacket type of thing. I’m not sure how it would work out with a lighter weight fabric like gabardine. Thanks Sarah! Luckily it was a busy fabric. I feel like I have seen some lighter weight versions on Instagram, and they looked good!